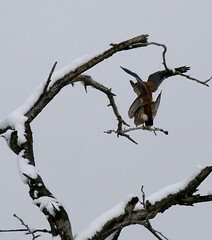 Well it is definitely that time of year. 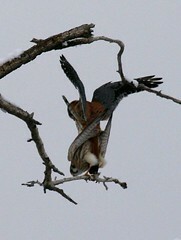 The early raptors are starting to mate. 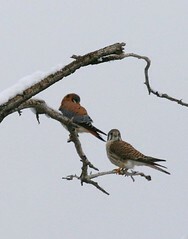 The Great Horned Owls have mated, the Redtailed Hawks are working on their nest, and the Kestrels are paired up. The non-raptors are starting as well - the male Red-winged Blackbirds are starting to claim their territory, although I haven't seen any females yet.. 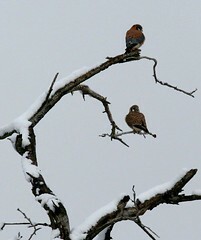 While we were out bird watching in the snow today, Karyn captured this sequence of photos of a Kestrel couple mating. Isn't there any privacy in the world?